Tom has the stomach flu, Johnny has a cold that might be pneumonia and Lila has pink-eye. Meanwhile, Katryna and I have a radio show at 9am. WKZE 98.1 out of Red Hook NY is calling us to do a quick interview for drive time to promote our show at Infinity Hall this weekend. Katryna had laryngitis and the plan was for her to come over to entertain my kids while I was on the phone doing the interview, but as it turned out, the interviewer was so late that I took a chance on trying to put Johnny down for his morning nap about 30 seconds before he called. So Katryna picked up the phone and ran up to the attic to get me the extension. Juggling both kids and the two phones, we did the interview together. I learned this wonderful technique from William’s preschool teacher, Julie. When I dropped William off on Friday I noticed these beautiful marbled looking splattery paintings on the wall. They looked like they had been shellacked or something. I asked how to make them. Here it is. So simple. So fun. Such gorgeous results. You take thick paper. I used Acrylic paint paper. They used a kind of white cardboard stuff. Then you pour some corn syrup on it. 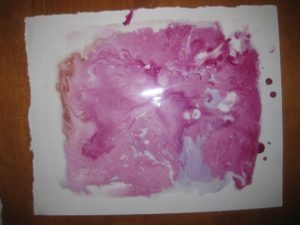 (This might be the one and only use for corn syrup-aside from marshmallows) So I poured some corn syrup on the page and then spread it around with a paint brush. Then you take watered down water colors. Ideally you have droppers- like for medicine- and you drop water colors that way onto the corn syrupy page. 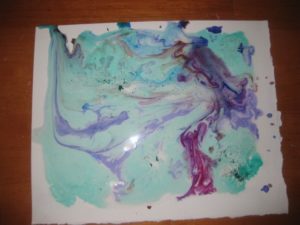 The paint is so cool to watch as it hits the corn syrup and sort of spreads out onto the page. You wait for the paint to stop moving and then you can add more colors. The greatest thing about this project is that the process is so incredibly fun and satisfying. Then the final project is inevitably beautiful. So fun. It takes a LONG time to dry. We did some last night and 14 hours later they are still a little bit tacky. Have a blast! Play guitar with abandon and let your mind go. Notice the kernel emerge and follow it. Let it get bigger and more developed and follow it some more. Squish it around in your hands. At some point, sooner or later, it develops its own organic structure. Then, hang ornaments on it as if it were a Christmas tree. A pelican fishes all day. The video will be posted as soon as it’s done! Johnny on the other hand, does not have pneumonia, but we did figure out that I’d completely forgotten to schedule a six-month visit, so our wonderful doctor gave him a check up then and there. It turns out he’s not gaining enough weight. There’s a scary term for this that I have conveniently repressed, something along the lines of “failure to thrive,” but not quite that drastic. He was 50% in weight at birth; 35% at 3 months and now he’s 4%. And 65% in height. A string bean. But with the cutest chubby thighs you’ve ever seen, so I just haven’t worried. My doc sure seemed worried though, and wants me to give him an extra feeding every night at 10pm. I went around for the next hour giving baths, cuddles and changing diapers and choosing PJs. Also feeling bruised and sore and sad. Lila’s at an age now where I feel like she’s always observing, always taking in more than I might assume. I am beyond grateful that I made the decision to work less, but even though I can feel the difference in my ability to mother these days, even though I certainly have more equilibrium, even though I feel so much more balanced and able to respond with agility and grace to the off-beat challenges thrown at me by my clever pre-schooler, I still am so far from perfect. Letting myself show my anger toward my husband in front of my daughter was just not the way I wanted it to go tonight. It so clashed with my vision of myself as Florence Nightingale merged with Carol Brady. Why don’t I have more self-control? And yet, I was able to apologize. I hope that’s worth something. After the kids were snugly in bed and I had called my mother to cry and get reminded that parenting is hard, marriage is hard, decisions about pre-school are hard and that being a traveling musician is hard, but all are worth it, I felt better. I found Tom and we talked reasonably and calmly about the festival and his kayaking trip and came to a happy solution and laughed and cried and hugged and made up. This is what we do. Anger is inevitable, and since death is certain but the time of death is uncertain, what are you going to do? And as Tom reminded me, these painful places where we rub up against each other can be our best teachers. They can lead to growth and wisdom if we open ourselves up to that possibility. Also, Harvey the Squirrel is alive and well and living in the DAR forest. And there is peace and quiet in the walls of my house once again. I’ve had some criticisms of your blog in the past, finding it too impersonal, too “safe.” Art means taking risks, going to the scary edge, and it always felt like you kept so many layers of protection on that the posts were more like “lectures.” By writing monthly, you seem to be breaking through that. You are letting us see more of you; you are showing the messy, untidy, real parts of life and art and human growth. Finally, you have stopped coaching us and are much closer to really writing and being an artist. Anne LaMott would be proud. Good work! Thank you for your honesty, I’ve really been enjoying your blog! My husband and I only ever fight for the same reason as you guys. I think it stems from us having kids later in life and being so used to doing all the things we enjoy whenever we want. I need to learn your little prayer… isn’t it amazing what a little perspective can do?!? oops–I meant to say, “by writing DAILY”–not monthly! Sorry–guess I should proofread my own messages.